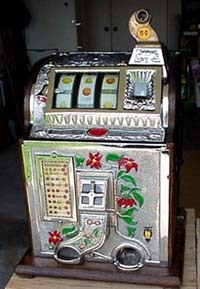 "Poinsettias" was originally designed as the centerpiece of a door panel for a specialty cabinet shop making Victorian styled cabinets for the display of antique slot machines. The machine this panel was designed to complement is shown here. The obvious design cue from this machine is the hand-painted Poinsettia flowers that adorn its front. An Internet search and selection of a dozen poinsettia images was conducted to study the details and characteristics of this flower. Several images were imported as backgrounds in separate design windows and were traced with Glass Eye 2000. This was followed by some editing to eliminate detail that would not fit in the scale of the proposed panel and to smooth out some of the lines for future glass cutting considerations. In designing the first series of panels I had decided to use a consistent border strip and use whatever design cues I picked up from individual machines as a composition in a central oval in the panel. I designed the rectangular frame, border strips, and central oval to fit the cabinet door frame dimensions, selected lead came line properties, selected glass in traditional colors used on the majority of antique slot machines, and saved the "frame" design file. From that point whatever I designed for the oval could be dimensioned and copied to the oval to finish a panel design. I selected three of the poinsettia tracing files, dimensioned, copied, and pasted them in an arrangement within the oval frame. A little editing eliminated overlapping lines and added connections between elements. A blue ribbon trailing through the flowers was added as a point of interest and to unify the composition. With the high level of detail using small glass pieces, I chose a 3/32" face width copper foil for the oval. Since this panel would be installed in a cabinet without interior lighting, I focused on the reflective properties of glass, rather than its light transmission properties. I chose Spectrum Silver Coats to highlight, brighten, and add sparkle to the flowers. I also chose a simple clear glue chip glass for the surround to further highlight the flowers in a subdued, random-textured background. At this phase of the project I learned that it is quite easy to design things with Glass Eye 2000 that are not so easy to build. The 9" x 23-3/4" "frame" was easy. The flowered oval was roughly 7" x 17" with many pieces smaller than ¼" and quite a few intricate curves. It was a challenge and I had committed to a delivery, but it soon became apparent that I would not make money on this panel. There were simply too many labor hours involved to execute this design at this scale. The finished panel appears as the first image to the right. This panel was sold to the cabinet shop owner as a "one-only" unique design at basically the cost of materials and labor. The wholesale price to which I had originally committed was calculated to yield a small profit. That small profit was eaten by unforeseen labor content. When this panel was delivered, I also presented a revised design for future deliveries. The cabinet shop owner readily agreed to the revised design, shown here underneath the original version. The revised design for the cabinet shop consisted of about 30 minutes of editing in Glass Eye 2000. I deleted two of the flowers in the original design and enlarged the single remaining flower until it mostly filled the upper two-thirds of the oval. Free hand drawing, I added additional petals and lengthened the stem. I then re-drew the ribbon and manipulated its shape by dragging the knots around until I was happy with the appearance and balance of the design. I kept the same glass selections that I had in the original design. The design revision was done just hours before delivery of the panel. Without Glass Eye 2000 I would not have had time to redraw the pattern and present my alternative design proposal when I delivered the finished panel. Glass Eye 2000 helped me maintain a professional image and avoid awkward explanations and follow-up promises. Revising the pattern for "Design of the Month"
At a larger scale the original design is more practical to construct, and revising it for Design of the Month is also a good example for a common use of Glass Eye 2000. The oval section from the original rectangular panel was selected, copied, and pasted into a new design. It was then dimensioned to a larger size and the widths of the lead lines were widened to keep them proportional to the larger design. The glass selections were changed to adapt the pattern for a window rather than a cabinet door panel. All in all, it took about five minutes of editing to adapt the original design to a new application. To make this project more appealing, the dimensions have been set to fit a standard 17-1/2" x 28-3/8" (opening), 2" wide McNeil Oval Oak Frame. McNeil frames are available through most stained glass suppliers. Joseph 2bears Art Glass Studio is a husband and wife home-based business located in Lomita, California (near the Los Angeles Harbor). Started as a hobby and part-time business in 1981, it was transformed into a full-time business in 2003 when I took an early retirement from an Engineering career. I design stained glass panels, while Vicki Lynn does glass etching and engraving. Please visit our website to learn more about our studio and view samples of our work, or write to me at joseph@joseph2bears.com.